Please give me your money so I can buy some food with it. 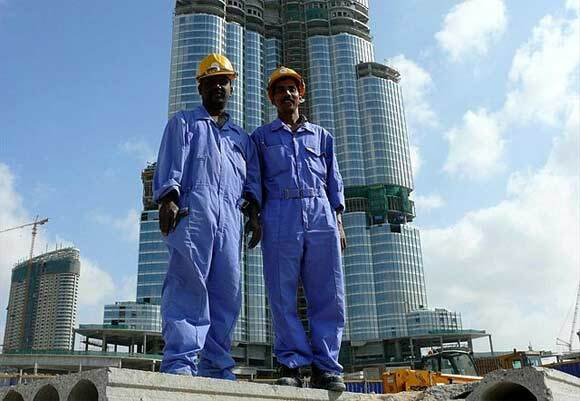 Not for me, but for the guys that toil and struggle every day in their efforts to build (and maintain) this sparkling, modern metropolis called Dubai. Workers getting on the bus heading back to camp. The skyscrapers that they build in the background. I don’t normally beg for food. And if it was for me, I would actually just rather do without (I could probably stand to lose a couple of kilos anyway). But the money I’m asking you for is for a more worthy cause – one which my longtime readers will already be familiar with. Can you believe it’s been 18 months since I last asked you, my friends and family, to help me bring a smile to a labourer’s face (by putting some food in his belly)? Well, indeed a year and a half has tumbled past, and it’s time for me to once more get on my knees and ask you to part with some of your hard earned dollars. Those of you who have contributed before know that the driving force behind the food donations is Roshni Raimalwala, the hard-working, behind-the-scenes advocate of the labourers and workers of the city – the ones that the government should be doing more to look after (check out the other work she does with Care 2 Share UAE). She is out there every week (sandstorms and searing sunshine be damned) organising food and grocery handouts on behalf of companies, schools and sometimes individuals – like us – that wish to help. During religious holidays like Ramadan and Eid, she also arranges larger hampers filled with toiletries, clothes and bedding. Things the workers need and want, but simply can’t afford to buy on their own. Standing in front of the building they helped to build but will never be able to enter. On Friday, 24th April 2015, David and I will be going to Muhaisnah labour camp (more commonly known as Sonapur, which ironically translates from Hindi as “Land of Gold”) where Roshni has facilitated a handout to be done by some children from one of the local schools. How wonderful is that?? I really think that growing up in this city, it’s super important for young kids to realise that Dubai is not all about beach clubs, malls, nannies and sparkling new bikes. If they can see that the reason this city even exists is because an entire collective of human beings from another continent have built it from the ground up, surely that’s a great lesson for them to learn. Another important lesson is to see that there are people less fortunate than they are, to put a face to those people and to reach their hands out to help them. To make the situation real. I believe that compassion is one of the most meaningful things that anyone can learn, and even better to learn it from a young age. I am really looking forward to participating alongside, and meeting, the young philanthropists who have promised their time and energy towards the cause. I wish you could come along too – and if you’re in Dubai and are interested, please get in touch with me and we can make that happen. But if you are in Australia, or the US, UK or anywhere else in the world, and would still like to be involved, then please just pledge me a little bit of dough. It doesn’t have to be a lot. If you can make do without ten pounds, or five bucks or even just 20HKD then that will still contribute a great deal towards providing a tired, hungry, poor worker with some food that he otherwise would not have enjoyed. If you can spare more, that would be even better. Between us, David and I will match every single overseas donation. So if you all raise the equivalent of 2000dhs, that’s how much we’ll put in the kitty too. If it’s more, then we’ll be happy to dig deeper. After all, it’s just money, right?